Big news this weekend when the state’s largest newspaper, The Oregonian, recommended a No Vote on the Measure 101 the $330 million health care tax. The Oregonian joins the Bend Bulletin and the Baker City Herald featuring No Vote voices on the massive $330 million health care tax, Measure 101, that small business has to pay but big businesses and unions are exempt. It is fantastic that the newspaper are spreading the news on the unfairness of this Measure 101 tax which will hurt families and small businesses trying to pay for their health care. 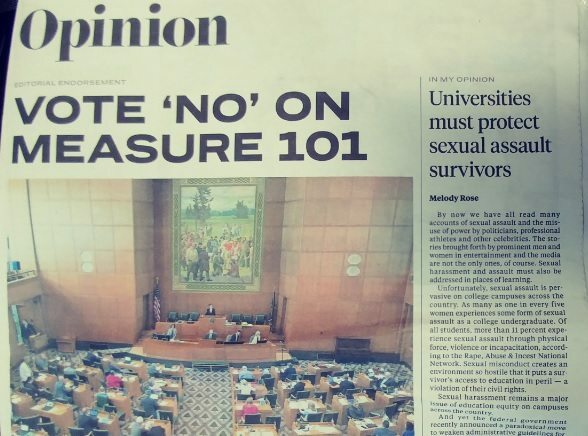 Below is the Oregonian editorial on Measure 101. The sheer complexity of Medicaid funding makes Measure 101, a referendum on new tax provisions, a difficult issue to put before voters. The question of how to fairly pay for such an essential program is exactly what the Oregon Legislature and governor should have figured out. The problem is, they failed the fairness part of that challenge. Instead of treating Medicaid as the shared responsibility that it is, Oregon’s elected leaders adopted a funding strategy that includes a tax on premiums for health care plans bought by small businesses, K-12 school districts, nonprofits and even thousands of college students – about 1.25 million Oregonians in all. The 1.5 percent tax, however, will not be assessed on health care plans for 727,000 people enrolled through their self-insured employers nor on hundreds of thousands of seniors and veterans enrolled in Medicare or plans for veterans, due to federal restrictions on such state-imposed taxes. This tax is at the heart of Measure 101, a January ballot measure that asks Oregonians to either vote yes to keep the provision or vote no to scrap it. Oregonians should stand against the inequity of this tax, demand that lawmakers find a fairer way to meet the Medicaid obligation and vote no on Measure 101. This is not an easy decision, because there are real risks that accompany a defeat. While not all Medicaid funding passed by lawmakers is affected by Measure 101, a rejection by voters would invalidate both the 1.5 percent tax and a separate 0.7 percent tax on hospitals that collectively are worth about $210 million to $320 million. The state would have to figure out how to replace that portion of the funding package in order to draw down enough federal dollars to maintain current benefits to the 1 million Oregonians covered by Medicaid. While Oregon’s thriving economy continues to generate record revenue, it’s no small feat to retool a biennial budget six months into the first year. Tax opponents Reps. Julie Parrish, R-West Linn, and Cedric Hayden, R-Roseburg, have offered alternate funding proposals to fill the gap, but it’s unclear whether they will provide sufficient funds to replace those lost. The Legislature may well have to look for savings in other agencies or could seek to cut benefits, provider costs or enrollment instead – an outcome nobody wants. But a “no” vote is the only way to hold the Legislature and governor accountable for their failure to budget responsibly and fairly fund this program in the first place. The state knew in 2012 that a five-year federal commitment secured by former Gov. John Kitzhaber to support Oregon’s health-care makeover would expire in 2017. Leaders knew back in 2014 that the state would need to shoulder an increasing share of the cost of the Affordable Care Act Medicaid expansion starting in 2017. But that long lead time did nothing to prompt leaders into preparing ahead of time. Instead, the legislative session began this year with dire talk of a $1.8 billion deficit – despite record revenue – because of the massive health care bill and growing pension costs. The failures continued. Rather than address its spending, legislators instead added to it with new programs and public employee raises while refusing to take any meaningful action on taming escalating pension costs. And so, as part of the overall package to fund a $600 million-plus hole, policymakers turned to the premium tax, just as they did in 2009 and 2011 to pay for health coverage for kids. Already, the tax has been incorporated into 2018 insurance rates for the small and individual markets. Few states in the country impose a premium tax, according to the Kaiser Family Foundation. And most states that have expanded the population eligible for Medicaid, including California and Washington, have covered increasing costs with General Fund dollars, according to the foundation. By doing so, those states recognize Medicaid and the expansion as a policy priority that should be paid for by the public at large. Proponents argue that the state, by federal law, is blocked from imposing the premium tax on “self-insured” health plans, which typically only large companies can afford to offer. (The Oregonian/OregonLive is self-insured). But that defense only reveals how backwards this funding strategy is. The state isn’t looking at who should pay a tax for Medicaid. It’s looking at who lacks the legal protection to block one. That’s a cynical approach to funding a program that Oregonians across the board and political spectrum support, need and want to protect. It also raises the question of just how temporary the premium tax will be. The state faces budgeting for a higher share of Medicaid expansion costs in 2019 and 2020. Will it again turn to such “tried and true” methods as the premium tax as they did this year, as Providence Health & Services lobbyist Jessica Adamson told The Oregonian/OregonLive Editorial Board? Perhaps with a higher rate? By itself, the structure of the tax offers numerous reasons to reject Measure 101. The well-documented dysfunction, mismanagement, misspending and secrecy that has dogged the Oregon Health Authority’s oversight of the Oregon Medicaid program only gives added fuel. Under Kitzhaber, Oregon smartly and courageously committed to a health care experiment that sought to broaden coverage, promote preventive care and decrease the cost of health care. The state enthusiastically embraced the concept of expanding its Medicaid population under the Affordable Care Act and has continued to champion an ethic of coverage for all. Oregon – its leaders, residents and taxpayers – believe in the necessity and importance of a health care safety net for the state’s most vulnerable people. Voters should reject Measure 101 and tell legislators and Gov. Brown to come back with a funding plan that reflects that shared value.